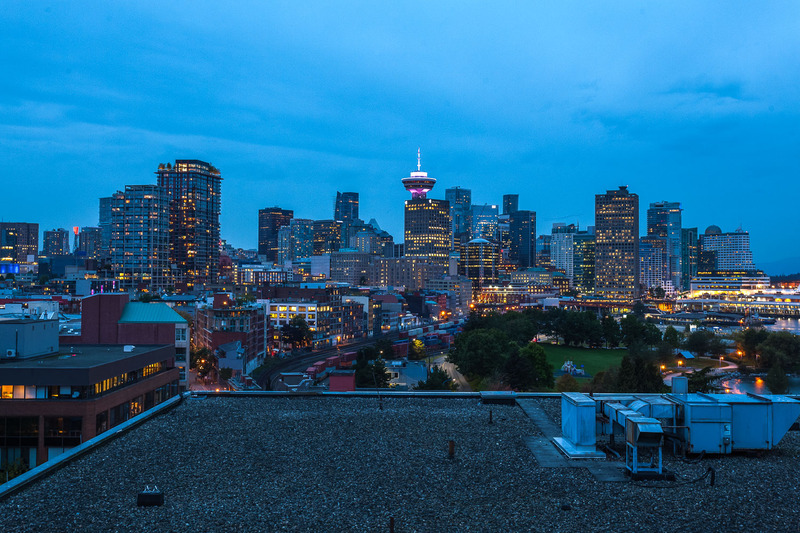 In Vancouver, the condo building called “The Edge” is the epitome of urban living. 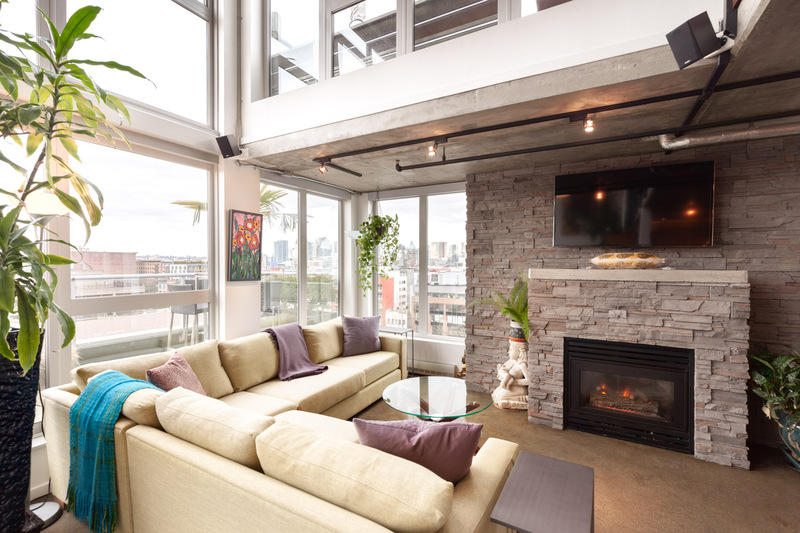 The unit #1002 is a penthouse loft that stands out among the rest. 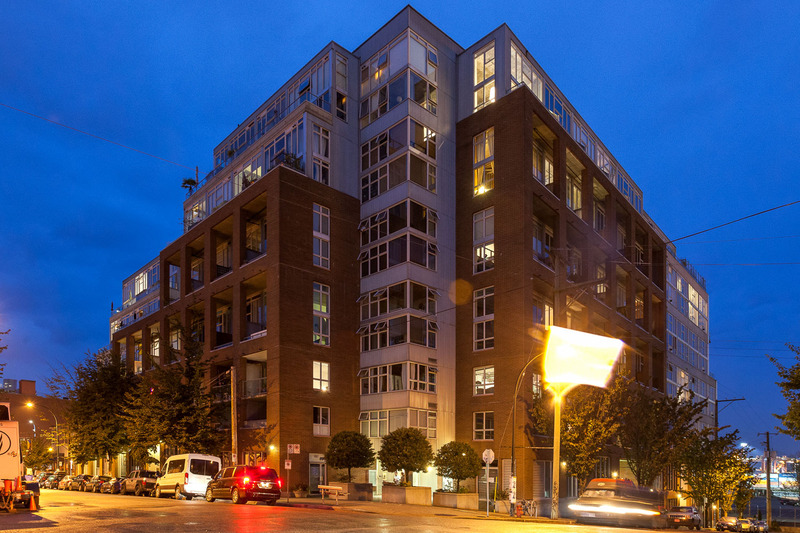 It boasts an architectural style that reflects the urban life often found in the Downtown Eastside. The exceptional condo has 16’s ceilings and floor-to-ceiling windows to let the natural sunlight in. The kitchen and dining area have plenty of space for cooking and entertaining. As you walk into the chef’s kitchen, you’ll see the custom built-ins that make it unique like quartz countertops, a kitchen island, a Wolf gas range and an integrated dishwasher. The living area on the main floor is equally spacious. It has an inset gas fireplace and an open office space that leads to the upstairs master bedroom. Despite only having one bedroom, the condo has space to spare on the second floor. The huge master bedroom has a walk-in closet and an ensuite bathroom. Next to it, the guest bathroom has a sleek walk-in shower and heated floors. Whenever it's sunny outside, the two large patios with more than 350 sq ft are the perfect spot to take in the warm weather. The main floor has a patio facing the South, while the master bedroom has a private West facing terrace. These spots offer stunning views of the Vancouver skyline. In this penthouse, the chosen architectural style is what makes it unique. By taking cues from industrial spaces, this loft reflects the urban living of the city. 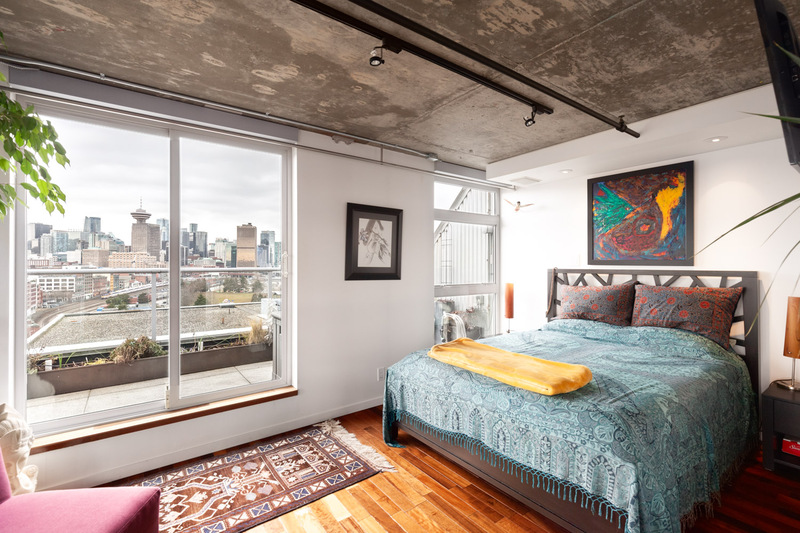 The condo is polished with concrete floors, walls and ceilings to achieve a “warehouse” feel. Large windows illuminate the open space, and a natural colour palette allows the area to feel bigger while giving furniture the opportunity to be the highlight of the room. There is also a mix of textures throughout the condo. 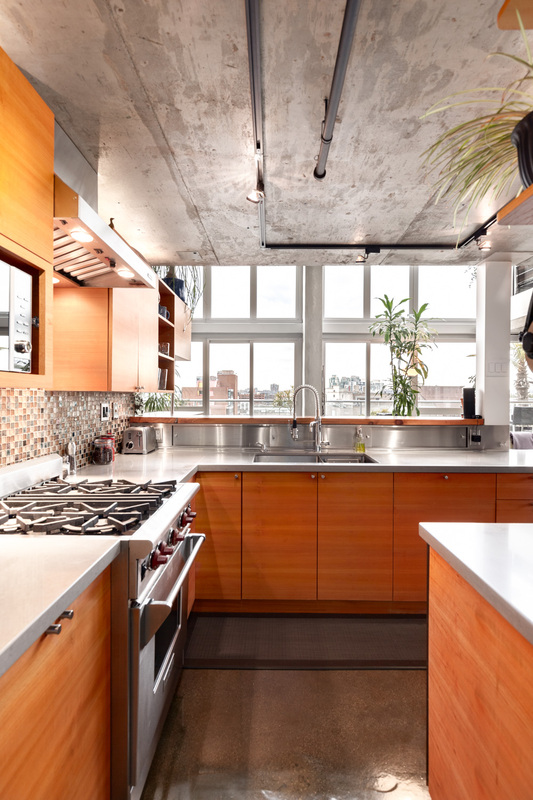 The kitchen perfectly blends wood, tile, metal and concrete to create a contemporary look. The tiles help liven up the space, and the metal barstools are paired to tie in the industrial theme. The master bedroom has the “unfinished” feel that industrial design tries to achieve. 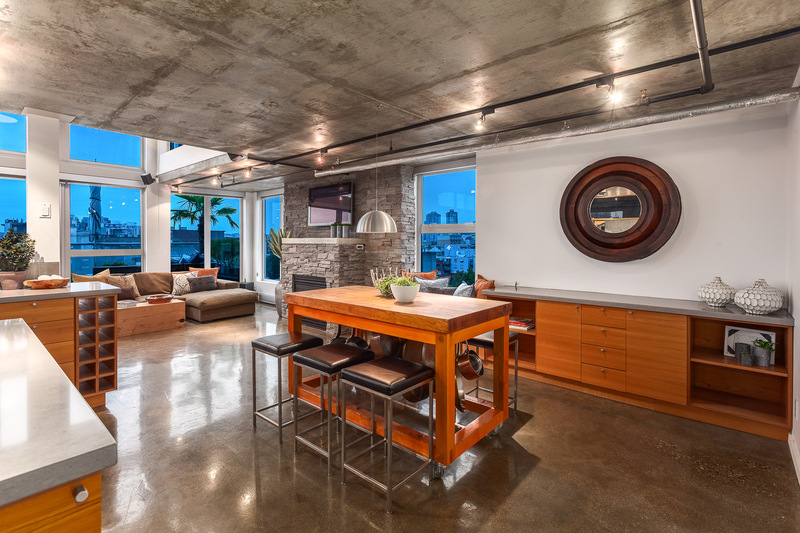 The concrete ceiling and the hardwood floor is mixed with exposed metal pipes and lighting fixtures. The Edge also carries the industrial theme throughout. The condo building was constructed with reinforced concrete in 1999. Some of the amenities this building boasts are a pottery studio, a band room, a gym, and more for those who live and work. It is a popular building in the area with a reputation for proper maintenance and good amenities. The modern kitchen with high-end appliances. The living room with floor-to-ceiling windows and a fireplace. The dining room in open-concept kitchen. The master bedroom with an entrance to the private terrace. The views of the city from the penthouse. The condo building "The Edge" located in 289 Alexander Street. This house is currently on the market. Save the listing and contact Anna Sawchuk to see the condo for yourself..